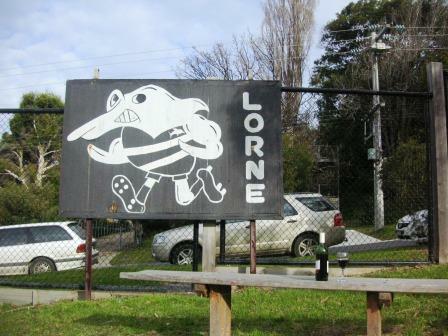 The Lorne scoreboard at Stribling Reserve sits just above the Great Ocean Road, at the foot of the Otways. The scoreboard was donated by the Kambouris family in 1996. Peter and Jim Kambouris played for the Dolphins in the 1980s. The family owns or has owned various coastal businesses, including the general store in Aireys Inlet and the Grand Pacific Hotel overlooking Loutit Bay and the Lorne pier. Rick lives in Aireys Inlet, about 75 bends away along the Ocean Road. When not thinking about goals and points or the seconds ticking away he does garden maintenance along the coast. 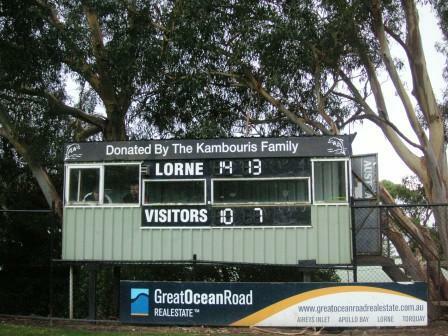 The green tin enclosed Kambouris scoreboard replaced a simple timber board, once a blackboard, which is now at the southern end of the ground and features the club mascot and logo. If young Ed Armistead hadn’t have been late to run the boundary on the old foreshore ground at Lorne he might never have spent the next 50 or so years looking after the scoreboard. Ed remembers the numbers being well-made, with the sharp edges filed off. “But if the wind came up, the numbers might blow off and end up on the paddock, on the ground. 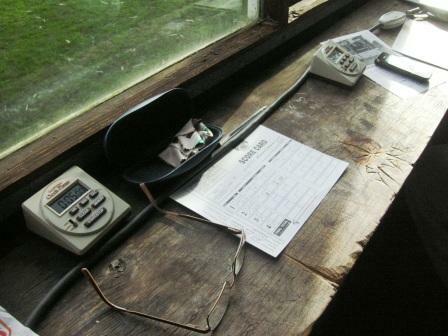 We sorted that out eventually.” Nowadays the Lorne scoreboard has digital-manual numbers, meaning current scoreboard attendant Rick Dosser has to change the scores with the numbers upside down. Such impartiality would also have been required during Ed’s 30 years as a member of the Colac and District League Tribunal. 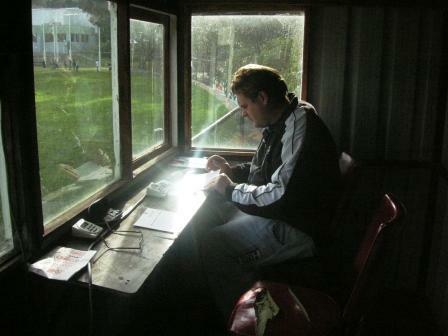 Now living in Geelong, Ed doesn’t get to as many games as he’d like but every Monday morning he checks the scores in the Geelong Addie. Last Monday he would have seen that the game against reigning premiers Irrewarra Beeac on 23 July see-sawed until the final quarter when the home team pulled away to win by five goals, boosting its chances of making the finals. The two clubs have a strong recent rivalry, having squared off in three successive grand finals, with Lorne winning flags in 2006 and 2007 and the Bombers beginning their hat-trick in 2008. 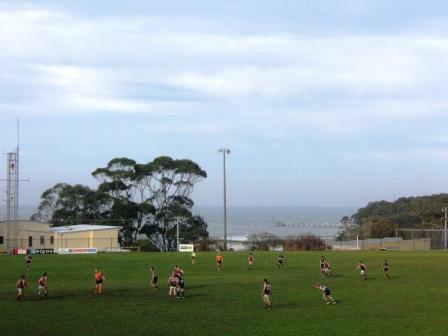 Lorne plays in the Colac and District League. It formed in 1896 and has won 18 premierships. More about the club’s early days (from the Footy Almanac).